Heron Rocks is one of my favourite spots on all of Hornby Island, though i probably say that about everywhere on Hornby! There is a very cool camping co-op here. If i ever took a holiday, i would spend it camping here. 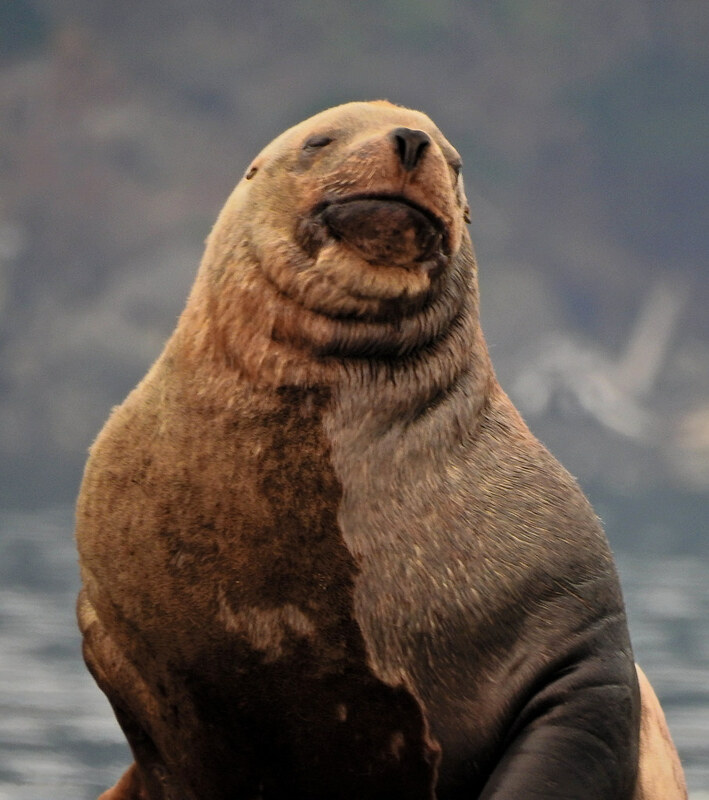 This is a great spot to see Eagles, Sea Lions surfacing & swimming past, Orcas, you name it. There are a lot of gorgeous Garry Oaks here, & in the Spring the wild flowers are stupendous. The ancient First Nations presence is palpable, here. The earth is black & full of midden shells. Last year*s posts about this territory can be found here. i had a dream come true when i got to go out with my camera & friends on the Hornby Island Dive Boat! It was a cold damp dark day & the boat is ice cold aluminum to sit on. i had on about 8 layers & was only just warm enough. 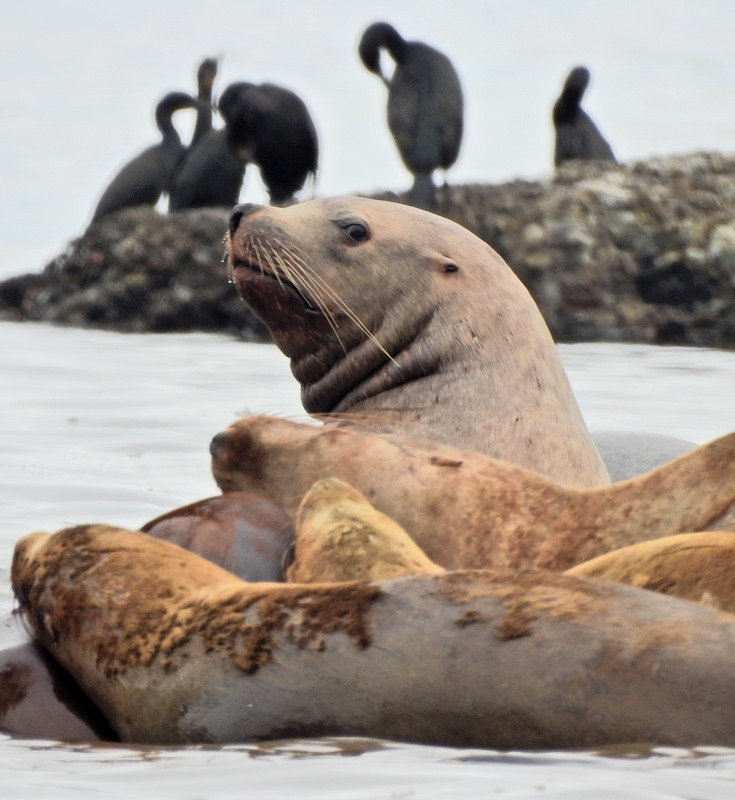 We left Ford Cove then slowly drifted past the Sea Lions on Norris Rocks. Taking fotos from a moving, bobbing boat is not easy! It was hard to even get focused on anything. At first i thought none of my fotos were any good, many just weren*t sharp, but what the heck, i made the best of what i got. We were being taught the whole time by the boat owners. i was trying to photograph & listen at the same time. i learned a LOT, but i*m not sure i remember much of what i heard. 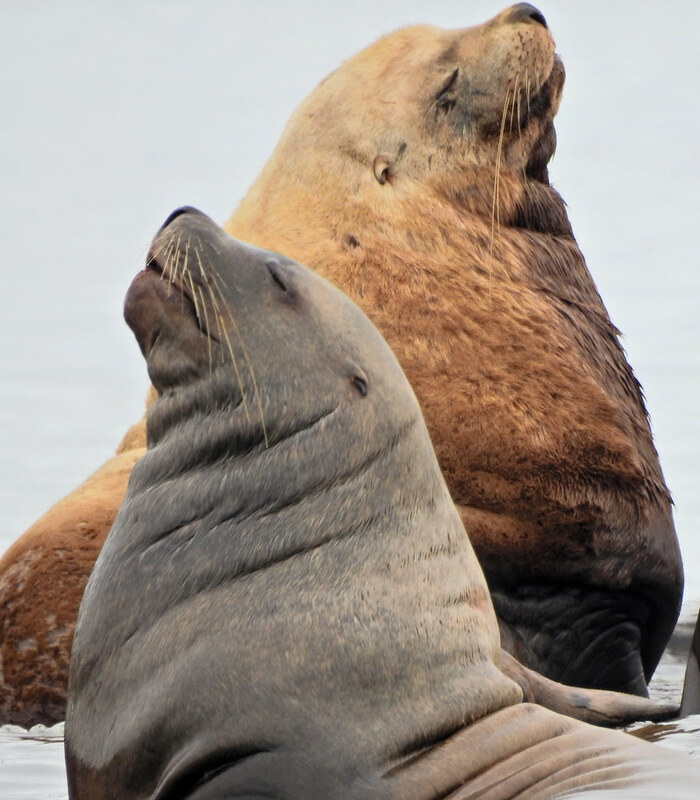 i knew that our Sea Lions tend to return from their time away from Hornby in september. i thought they were all exclusively males, but they are not! 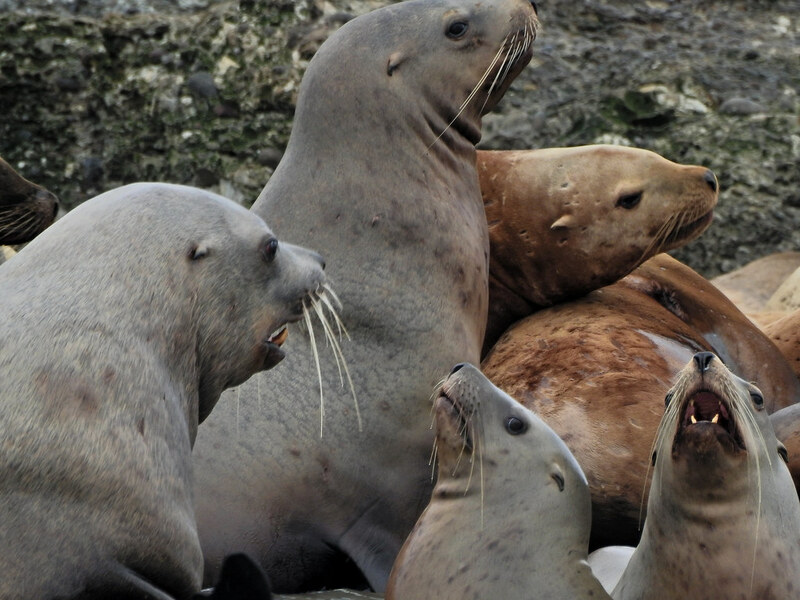 Some are California Sea Lions, while the others are the Stellar Sea Lions, the larger ones, i believe. There are also females in there! which i did not know, & even some young calves! 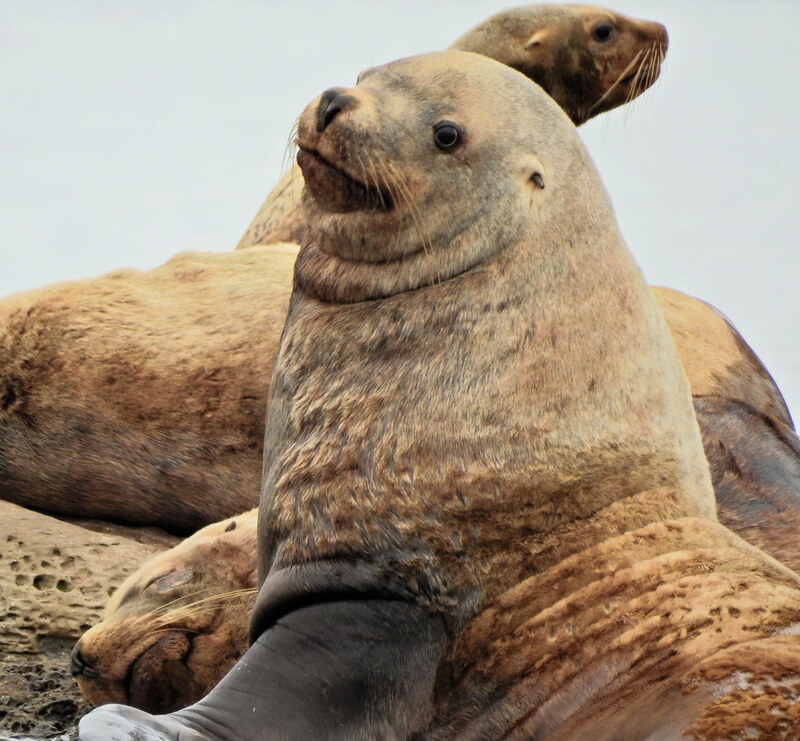 Notice the little ear flaps, which Seals do not have. There are resident Herring in the waters now, & this is what they are eating. i didn*t know that, either! 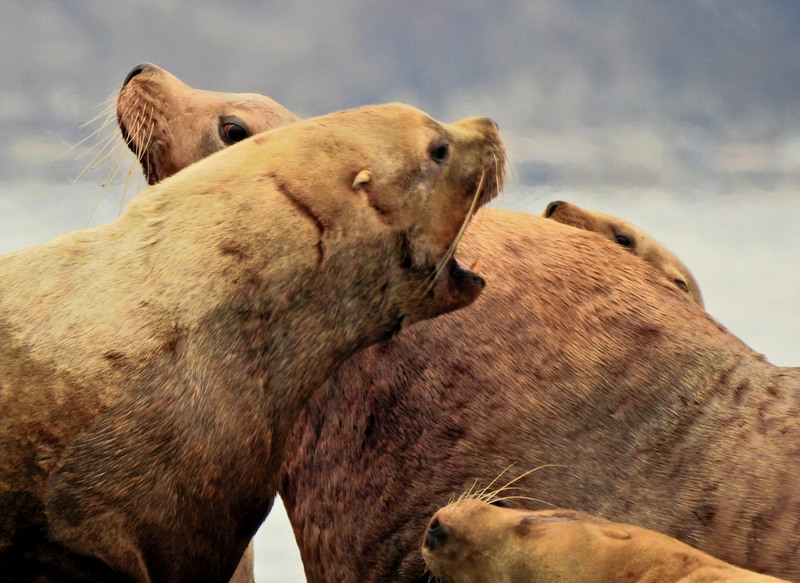 They all lump together like this in piles, growling & barking, yawning, & holding their heads & tails up to regulate their body temperature. The Stellars growl while the Californias bark if i remember correctly? In the background you can see some of that Hornby Tafoni rock, & some Cormorants! There were Gulls in the piles too. Ha ha, almost every foto i got i feel like i was getting photo-bombed by one of them, ha ha ha! Notice the one in the lower left corner seems to be molting their skin/fur. Look at the happy warm lumps of them! & one watching us drift by, totally unconcerned. 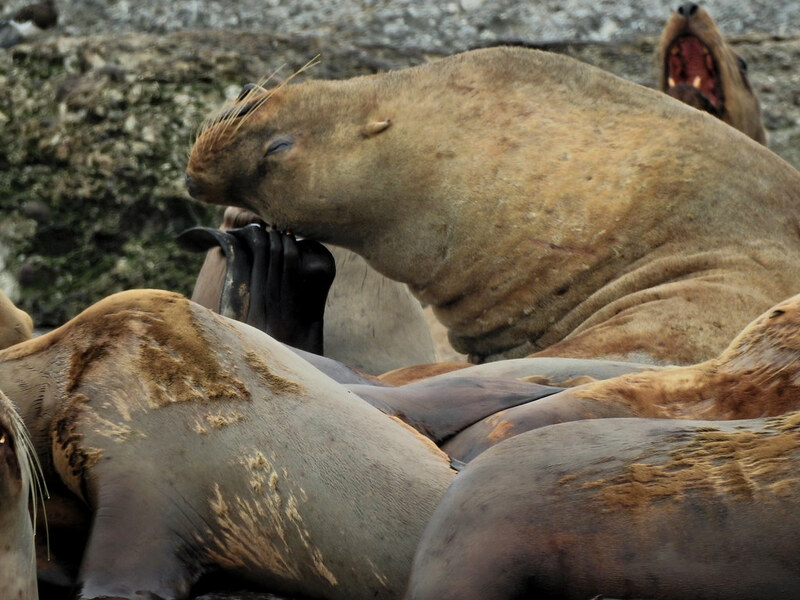 We weren*t as close as it looks, & i never saw one Sea Lion respond in alarm to our presence. 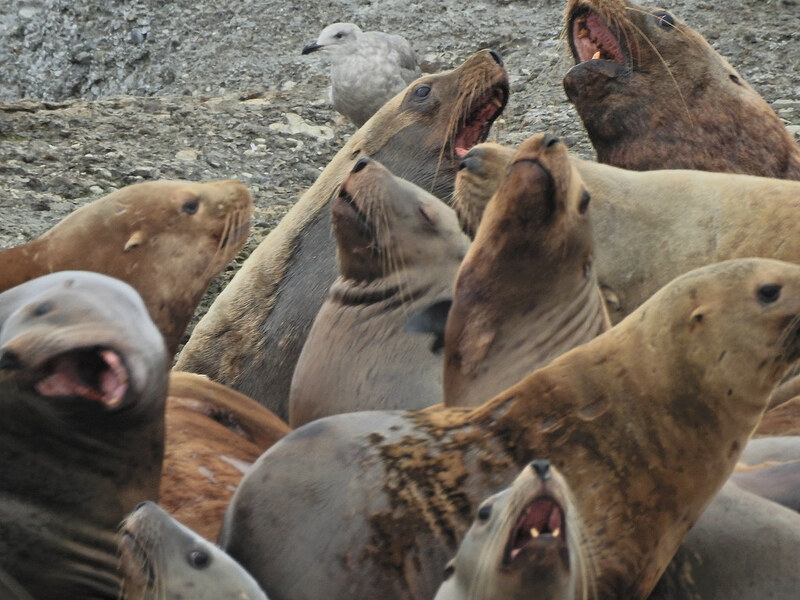 Having a good growl, or maybe a yawn. Lots of moulting in the lower left corner. Usually they take out divers in wet suits, who*s bums don*t feel the cold of the aluminum seats. 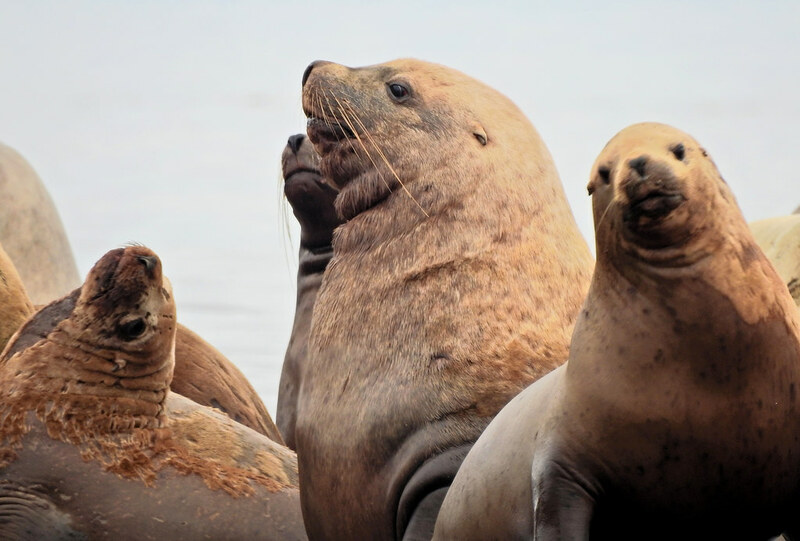 As gigantic as these Sea Lions are, in the water they go slender & long & graceful & fast, & a diver has never been harmed. 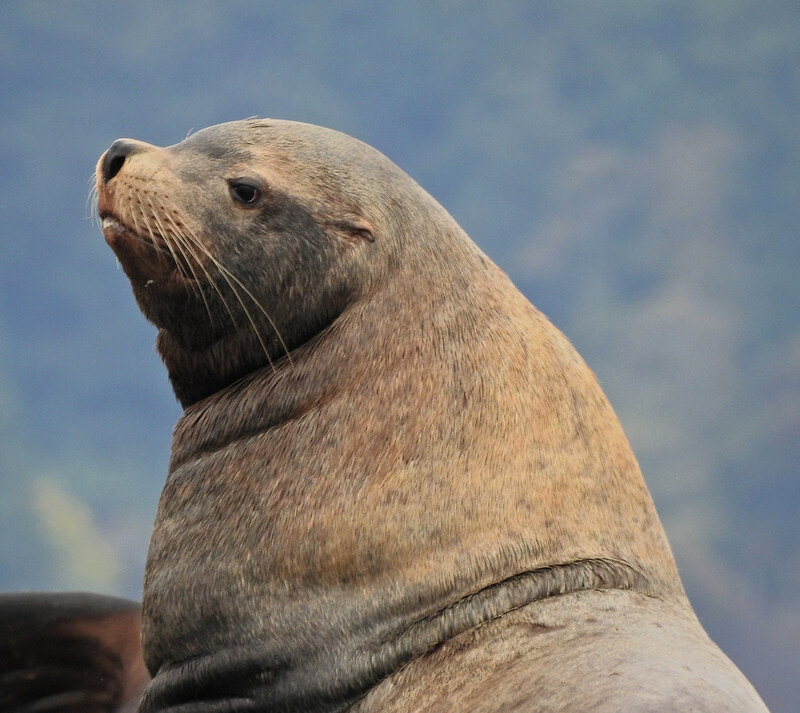 Sea Lions approach & are very curious & playful, even bringing a Sea Star to a diver. Ha ha ha, how many individuals in each of these fotos? 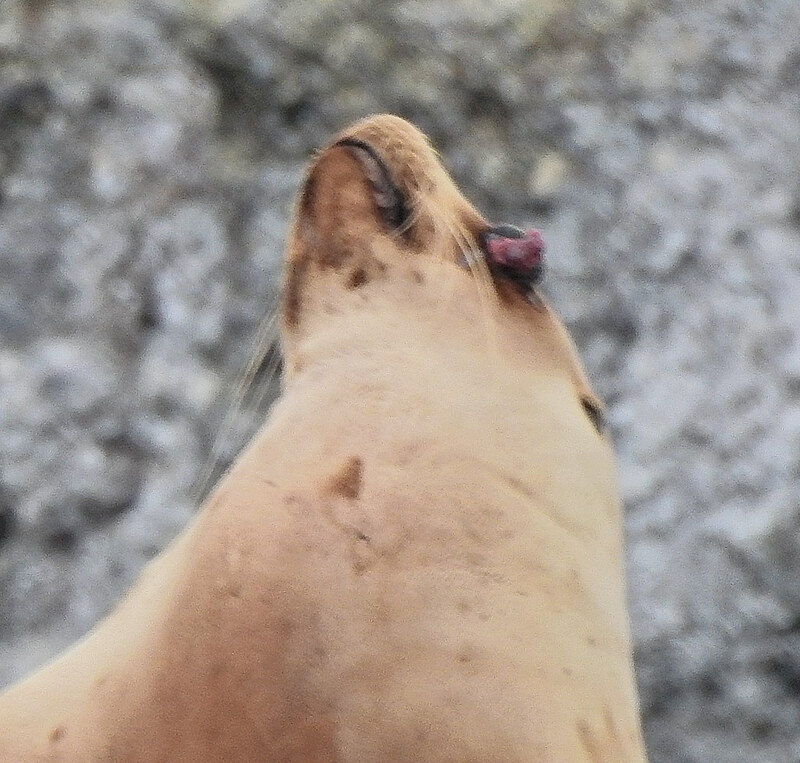 This one is chewing their fur as though to relieve an itch. i never noticed til one of my friends pointed it out that they have nails on top of their flippers! They use these to scratch themselves, & as weapons. i wonder if that*s a pup, lower middle? This looks like some kind of eye injury, one they see about once a year. My foto is being sent to marine vets for assessment. 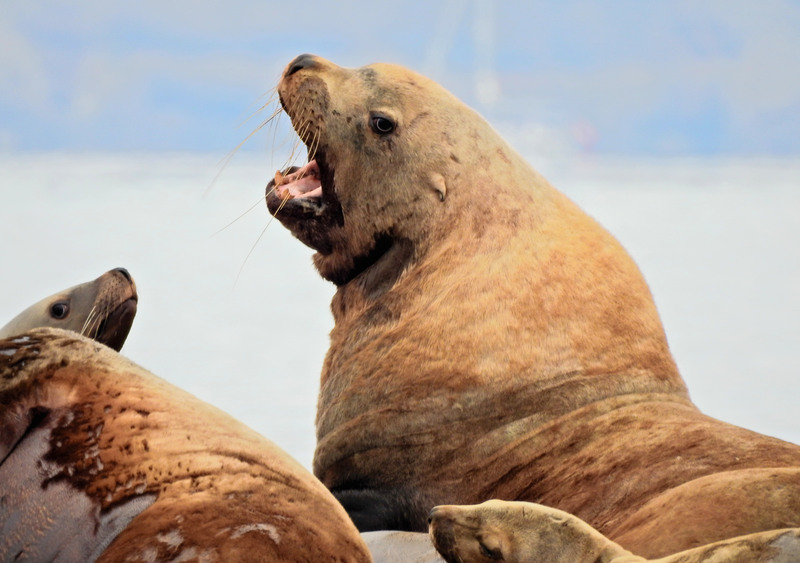 The Sea Lions also do a lot of play or practice fighting, using their teeth. Look at the tooth in the lower left corner! Using those nails to scratch. They are lumped & flippered all over each other here. Oh, & did i mention the SMELL? Look at this sweetie, half wet & half dry. Now we are off to Flora Island, off Helliwell! Really great photos, booni! You managed some great shots in spite of boat movement. 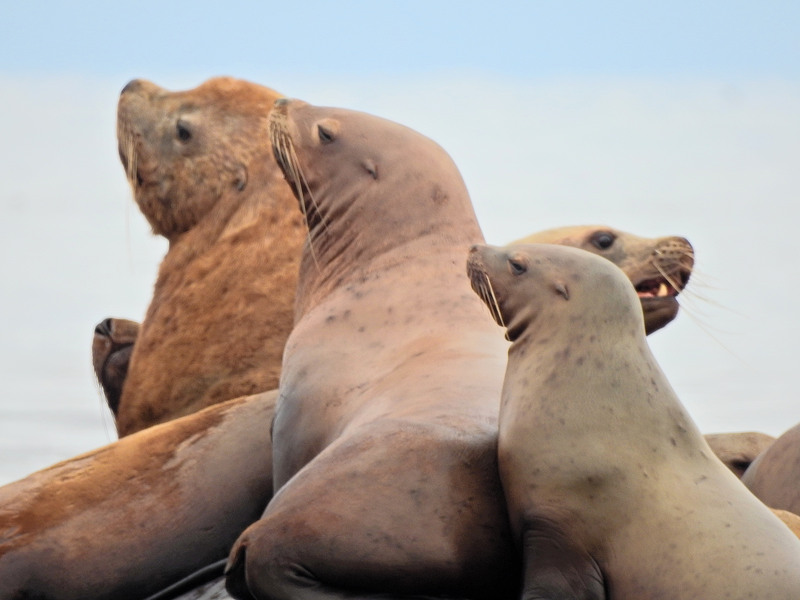 I find the sea lions fascinating, and see and hear them regularly where I live. It's always lovely to see them gliding by, but maybe not so lovely for those people who live close to their haul out areas - the honking can be deafening! What fantastic photos Booni.... thank you....love the faces.... just beautiful photos!!!! Wow - fingernails! Who would have thought that? 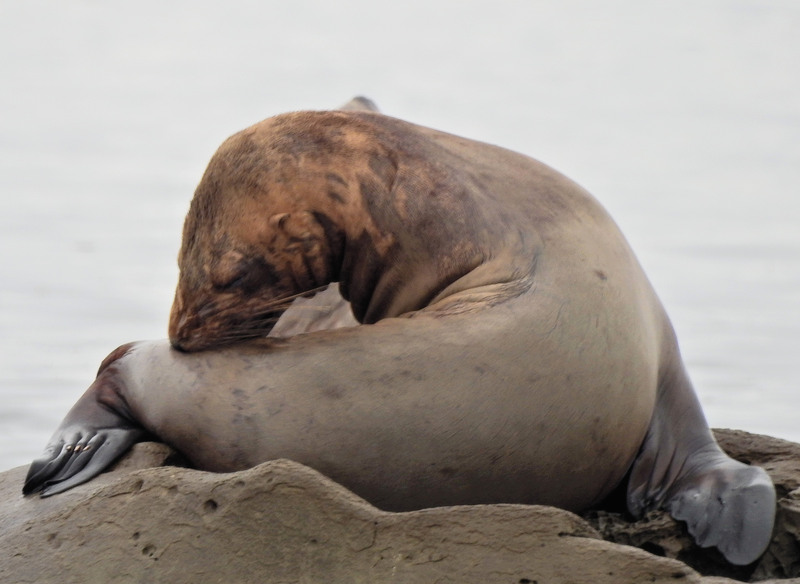 Yet we know that flippers are the vestiges of limbs left from days of living on land. That is incredible to me as are your amazing photos. Thanks again Booni. 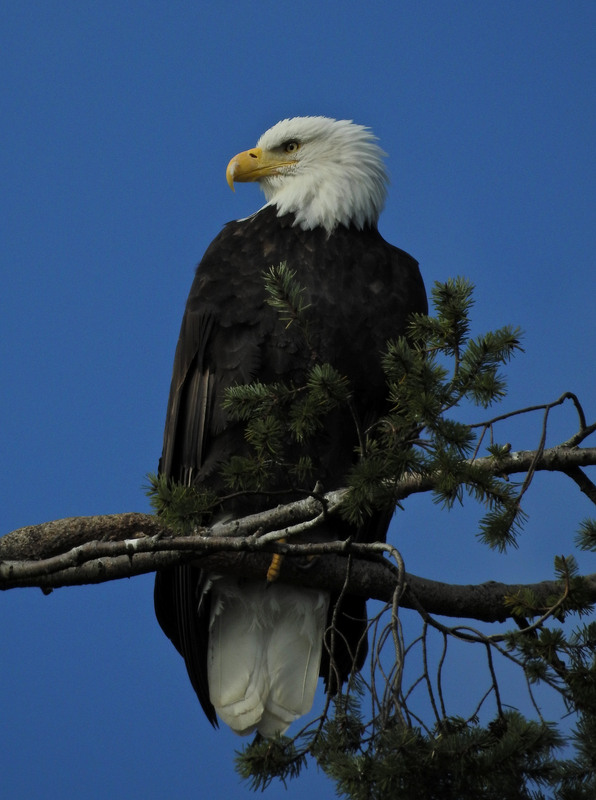 Walking through Heron Rocks we spotted this lovely Eagle perched in their typical perch branch. & then i spotted something completely different & much harder to photograph! This little one gave me a long time to try to capture them, but they are very fast. This is the best i*ve done on one of these tiny Birds so far. Upside down, right side up, it didn*t seem to matter to them. i think this was in a Garry Oak? My turn to take a walk around Heron Rocks today. At one point I could see a pair of Harlequins swimming close along the shore, so I went to wait for them, hidden behind a rock a little further along. When I put the photos on the computer I had a surprise. Click on the picture, then click again to better see what I mean. My first thought was an accidentally imbedded piece of wire, but the plastic-coated section going through the feathers looks kind of purposeful. Then Imp found a link to an article on Surf Scoters, with a photo of a study bird with a transmitter antenna coming out of its back. I'll try to find out more, and to get other pics of this handsome fellow (Harlequins are site-faithful, so this one should keep feeding in the same area). The wire is indeed the antenna of a transmitter. The bird is part of a telemetry study by the Canadian Wildlife Service. The goal is to track seabird movements over the course of a year. I've just been sent a whole lot of documentation on the study and will post some more after I've had time to read through it. There are currently 10 Harlequins with transmitters around Hornby. 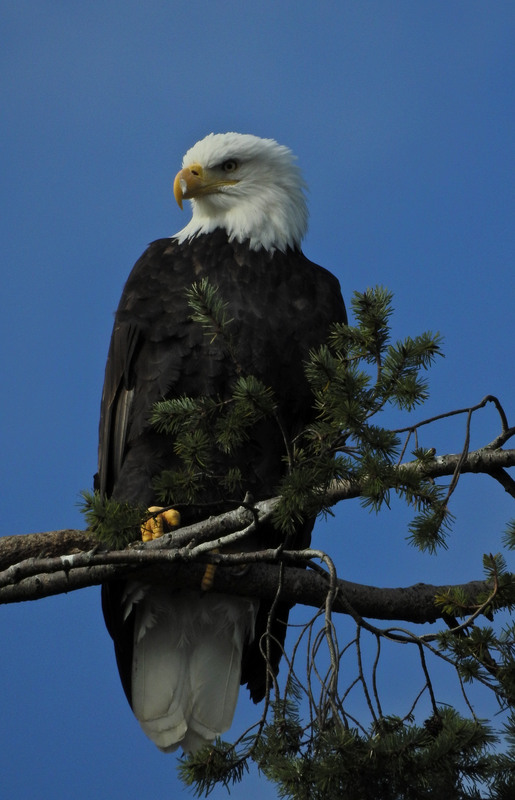 One of them flew all the way to Alaska before returning to his winter grounds here. There are apparently all sorts of new information coming out as a result of the tracking. 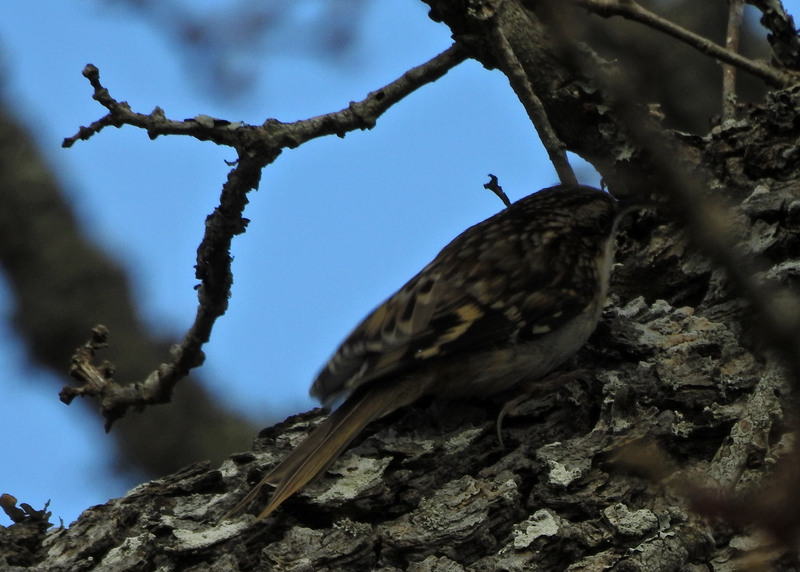 I love the little Brown Creepers. We see them in the Spring for a very short time. They creep up and down the tree trunks in a circular fashion, spiraling up and down! Here are bits of reports from the Harlequin monitoring, which start to show us how far 'our' birds disperse to go nesting. Both reports are from Sean Boyd, of the Canadian Wildlife Service, and are quoted with permission. 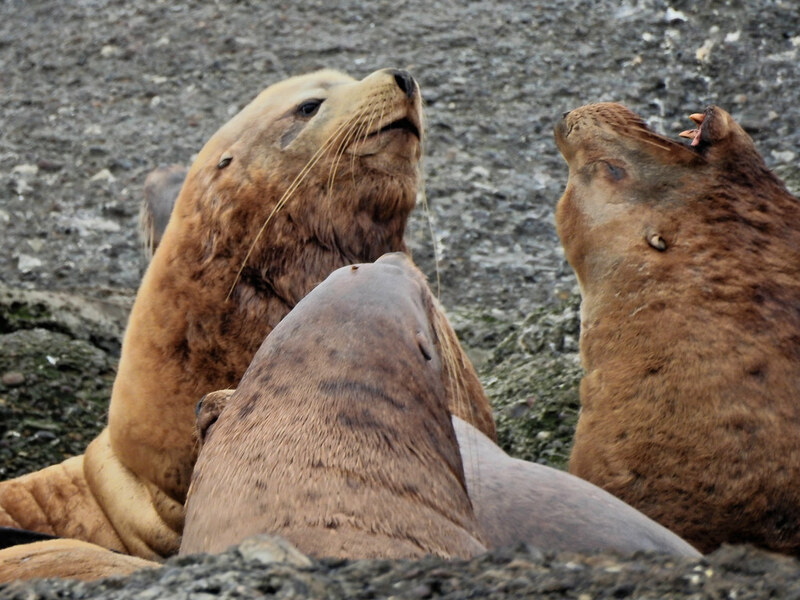 "We were able to mark 22 birds with satellite transmitters at Hornby and 14 birds at White Rock for a grand total of 36, all of which are still alive and signaling. 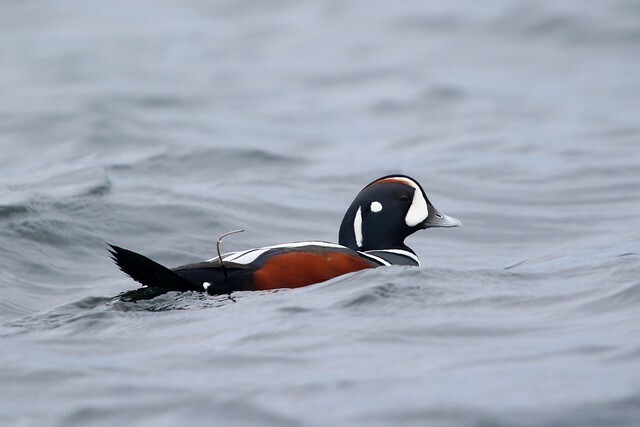 That’s a pretty good sample size to describe movements, connectivity, and site fidelity of Salish Sea Harlequin Ducks and to assess differences between two wintering sites.
" Hornby captures 17 & 18 March: Most of the tagged birds are still hanging out at their capture sites, Heron Rocks and Downes Pt. 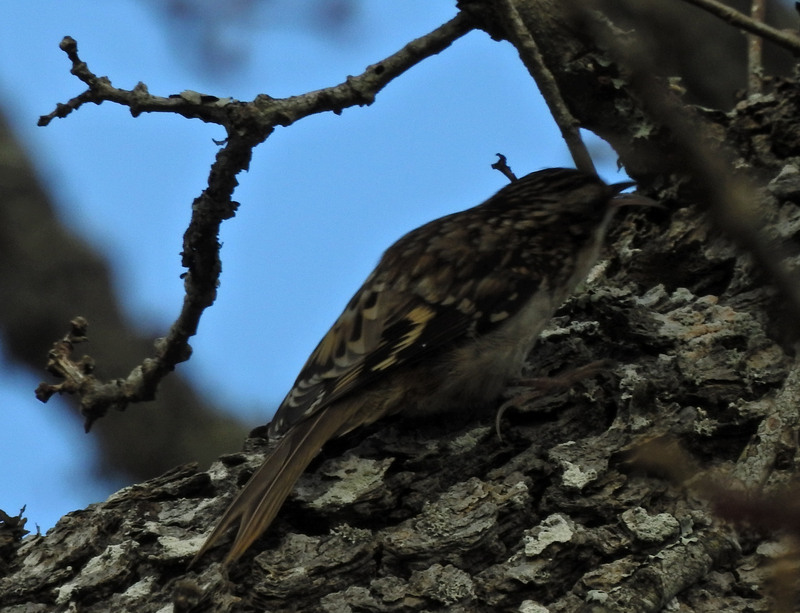 ; 3 birds have moved to the north side of the island; 1 bird moved to Dunsmuir on Van I. and has been there for at least a week; 2-3 birds appear to be on their way to Van I.; and 1 bird moved to Van I. and then back again to Hornby (possibly to take advantage of a recent herring spawn). "White Rock: 13 of the 14 birds are still near their capture sites between WR and Crescent Beach; 1 bird moved across to Birch Bay Pk; the only BAGO [Barrow's Goldeneye] captured at White Rock moved to Drayton Harbour near Blaine; finally, one Harly male marked last April near Kitimat and who spent the winter in the San Juan Islands, has just moved to Pt Roberts, possibly to take advantage of a recent herring spawn. "It will be interesting to see where all these birds go to nest: Coastal mountains?, Rockies?, Canada?, USA? 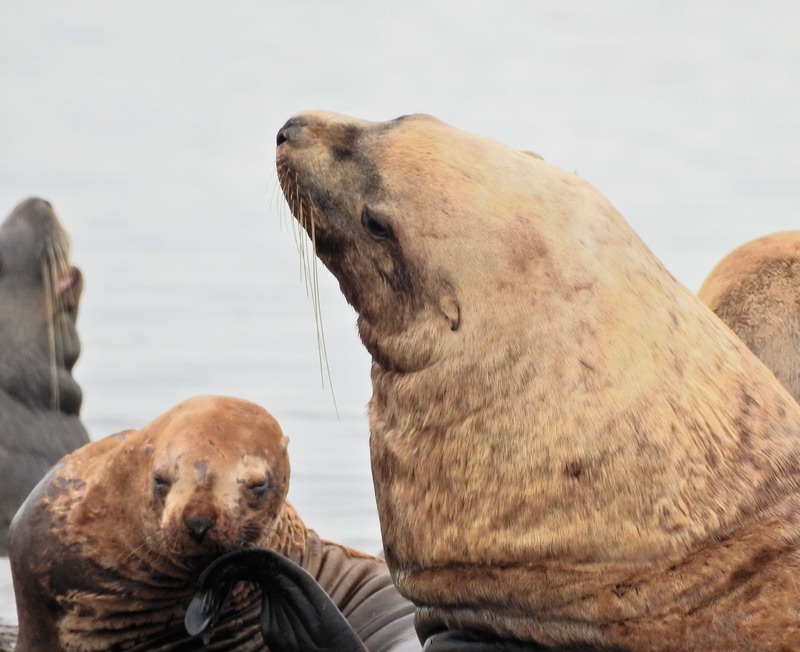 I’m also keen to learn where the White Rock males go to moult since they haven’t moulted there since 2006 (I suspect due to increasing predation risk from Bald eagles and/or increasing disturbance from humans)…. 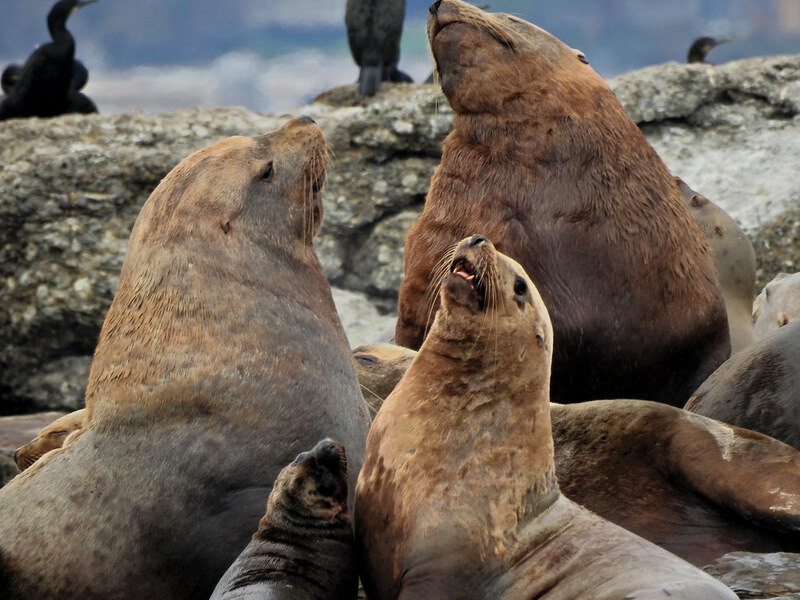 they do return to rejoin their mates but 2-3 months later than historically." 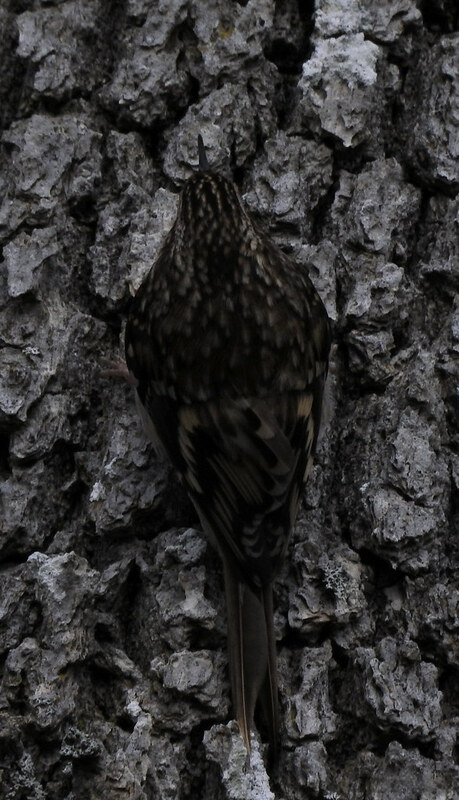 "Many of the Hornby Island birds have moved in the last week, some long distances: male 135702 just arrived to Jasper AB, female 135710 just arrived to Banff AB, and several others are in the west Kootenay Mtns. 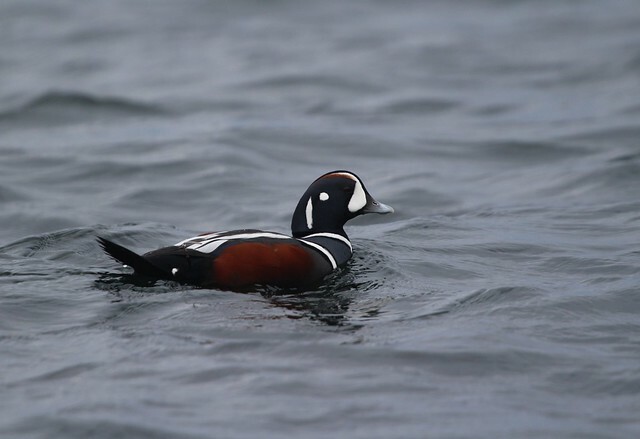 "The White Rock HADU [Harlequin Ducks] haven’t moved as far as the Hornby Island birds: male 144767 is near Revelstoke BC (for the last 2 weeks), female 135716 is in West Vancouver near Horseshoe Bay BC, male 144777 & female 144773 (a pair) are just south of Bellingham WA (for the last 2 weeks), and female 144774 & male 144780 (a pair) are south of Hope BC near the US border (on Skagit River system). Five marked HADU are still hanging out at White Rock but I expect that they will start to move any day now. 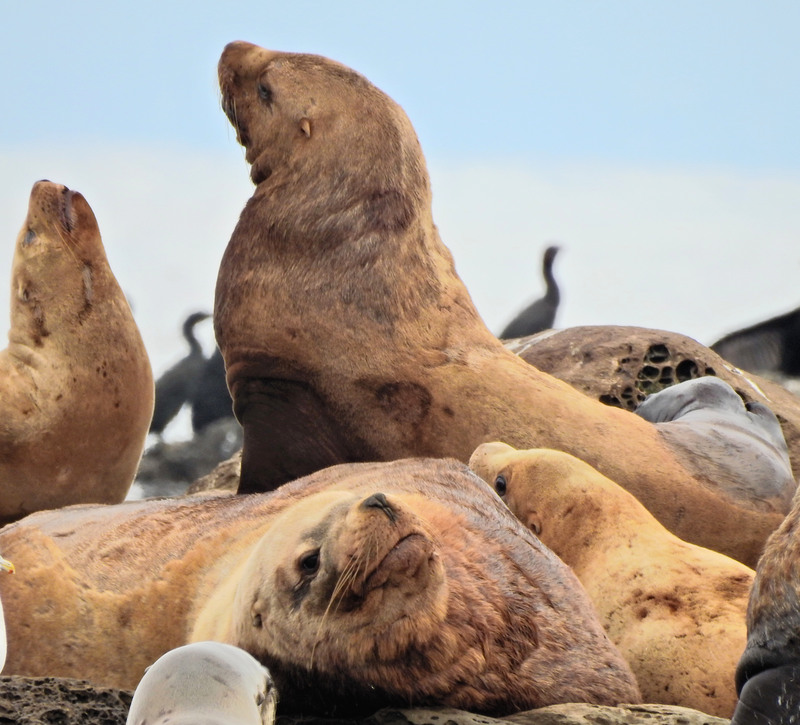 One of the objectives of the White Rock tagging is to determine where the males go to molt… and that should be apparent in the next month and a half."